And here it is… this is the last “chapter” of SEO principles tutorial and this one is going to be simple, direct and full of truths everybody still ignoring! Maybe the most important thing of all though, is your page’s content! It is the place where you can use all your important keywords in order to gain the best possible position in the search engines about it (along with the page title as we saw in the first part of this tutorial). Keep in mind that search engines love unique content and hate the copied/duplicate ones. It is always critical the way you are going to construct your navigational structure of your website. All websites have a “link depth“. The greater the number of clicks a link is from “home”, the greater the difficulty of reaching it & the same thing applies to search engines too! A good practice is to always try to keep your website to a 2 or 3 level depth and also use breadcrumb navigation. Websites with great link depth always need a sitemap. Sometimes, it is difficult for search engines to find pages hidden deep into your website’s structure (a lot of clicks are required…). So, in order to “help” search engines find them, you could submit a sitemap. This is not something you must do and it is not guaranteed that search engines will find your pages after that either. But you have nothing to lose after all. a. Try to decrease the size of images and scripts. b. Minify the number of requests your server makes. The first thing you must check when it comes to duplicate content is your non-www and www version of your pages. You must not have these two versions running at the same time because they are going to split up your page rank. Choose one version and 301-redirect the other to it. Also check for other duplicate content inside your site (2 different URLs pointing to the exact same page). Usually Google understands what is happening and chooses one page’s URL over the other as the ‘original’ one but you should really try not to have duplicate content in your website. Don’t get too excited about Meta Tags. Always try to make a good use of meta-description & never try to stuff more keywords than you can. Google AdWords and good ranking don’t go together. Don’t ever try to trick/cheat a search engine. Invisible page keywords can get your website removed from index. It is always the quality of your content that matter, try to focus more on that! This is the end of the SEO Principles tutorial. 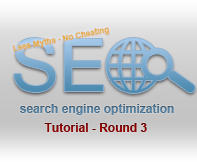 In these three parts of this tutorial we learned some basic things about search engine optimization and how to get better at it. Of course this was only a first step into SEO practices and there are still a lot of things you must be familiar with before you can master SEO.